Trying my hands on a classic british system. Unfortunatly it has not been possible to obtain a Hornby track library for the design-program, so I have used Märklin C-track instead, but the difference is enormous! Although I am happy with this (rather traditional) layout, I feel that for the moment I must decline doing any more layouts for Hornby systems. It´s a folded figure "8", with one of the circles set up for continous run, without goign down to the main station. This upper circle-part of the "8" is the Paradestrecke, and it is also here the shaddow-station is located. As this is a beginner level layout, track materiel has been kept down, but it should be fairly easy to add another shaddow-station. 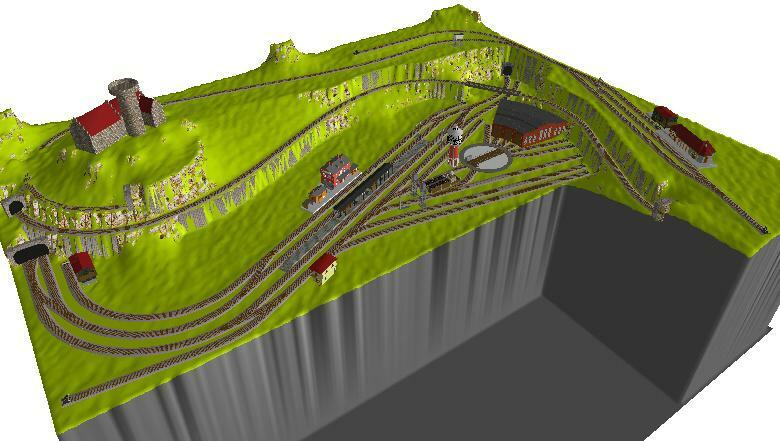 To give some variacion, a secondary mountain-line has been added, with connections to a terminal station and an industry. Upper level w. paradestrecke and shaddow station. Mountain level. 2 rounds helix.